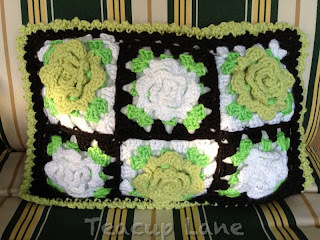 Summer Granny Cushions from this post. 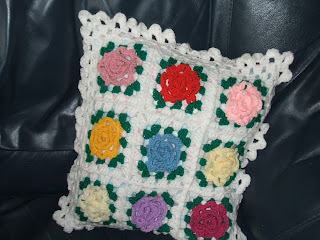 Flower Power Cushion from this post. Sunflower that just showed up one day. This one really has us perplexed....we have no idea where it came from. Spinach and Romaine were once here, as well...too hot now. I have made every effort, as of late, to refrain from purchasing items that will need further costs or work associated with them in order to make them usable or complete. The ideas and thoughts of "Oh my, with a coat of paint, or a little sewing or a crocheted edge...."
Do not let the price tag fool you...I took this dress to the manager and pointed out the broken zipper and she reduced the price to $9...yes $9!!! it cost more than the dress, haha. In this respect, I have a lot of respect for time and do not exercise my cheap frugal side. Yarn purchased at "The Twisted Stitch" on a recent trip to Monterey, CA. 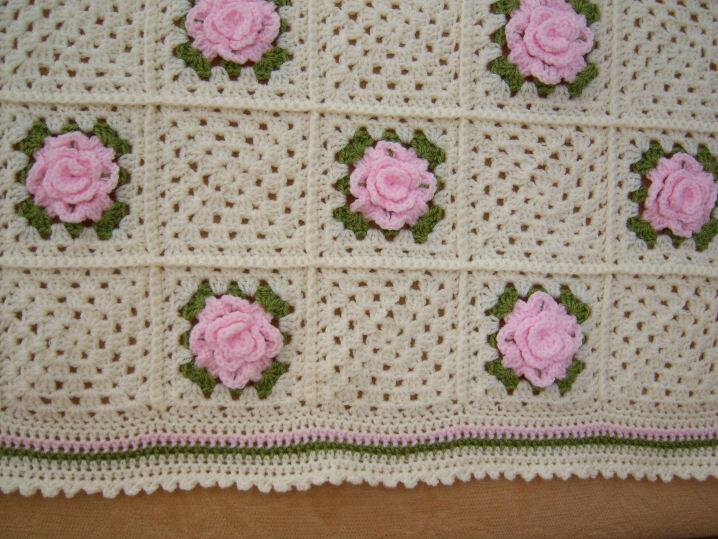 In the event that you intend to use this type of yarn for roses, please try to make *frogging unnecessary, as this does not work with this type of yarn. I can't stop 'til I get enough! Shall a support group be sought out for the "Rose" addiction? Have a Rosy (or Rosie) Day!!! a gift was waiting for me at the front door. Some little "Crochet Fairy Godmother" is making every effort to help me with my plan to use crochet as an award for exercise. She is a runner and she is helping me, and for this, I am eternally grateful. I tried it out for a jog and it works!!! The illusive yarn ball and crochet hook! 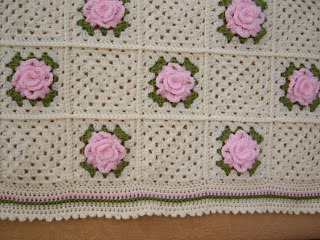 I am still continually getting more hits on the "Granny Rose CAL" posts than any others. It's difficult to express how totally delighted I am! Here are a few of you that have either emailed me their photos or I have run across serendipitously. These have also been posted on the "CAL "page here along with the others from the earlier posts. Fiona "Fee" has made this lusciously soft pink rose afghan. Oh my! It is so pretty. 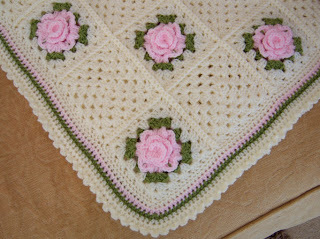 I love the alternating squares of roses with the plain granny; really makes a statement. You can find the Fiona's details on Ravelry here. Chris at Teddy Wares and Flutterbies..
She is still at...so diligent and so talented! She's been making them as gifts and also putting felt leaves behind the roses for brooches. 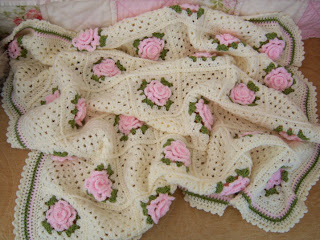 Linda at Linda's Craft Corner is at is again, with these ponchos. Please click here and here for her amazing posts. She has combined two CAL'S into one; clever gal! housework and I'm all about that! She calls it the Moonlight Pillow Cover. Click here to see her blog and post. 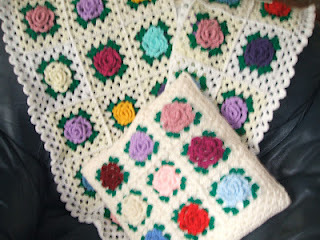 has made 100 of these beautiful squares from scraps, no less. The colors are gorgeous - just look at that purple/pinky color. Yum! 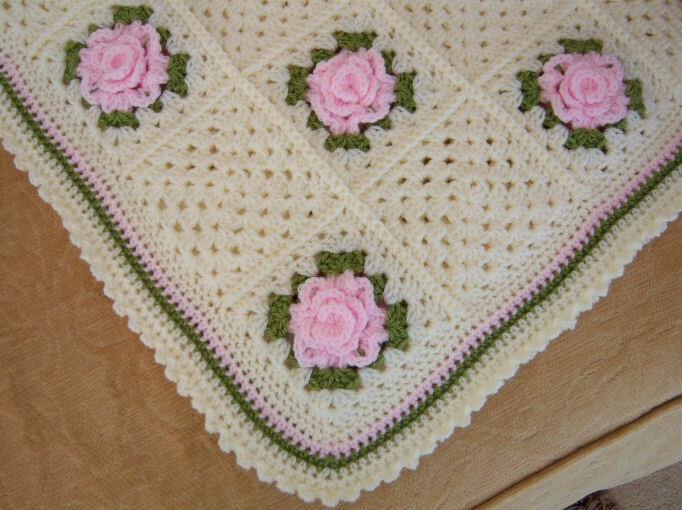 Click here for her post along with along delightful projects. Please let me know if I have missed yours and if you would like me to add it to this post or a future post and the "CAL" page. Leave a comment or email me at digger.lizzie@gmail.com. My heart signs with joy to see the rose granny popping up in the most unexpected places. Thank you all for so much joy!